This uses similar techniques to Nicomedes I but everything (cutting, gluing, shaping and finishing) is somewhat more difficult in acrylic. I worked closely with the owner and keeper of the laser-cutter to achieve a CO2 flow rate that would allow the laser to cut the acrylic cleanly without igniting it. This image shows how dramaitcally the colour can change with lighting conditions and also shows the convex curve of the bowl. 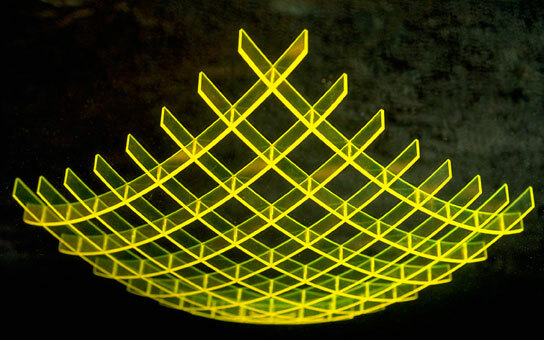 This shows the stunning effect of placing the acrylic bowl on a glass surface.